The AquaBee WaveMaker pump looks incredibly familiar, but on the inside it is different from any pump that we’ve ever seen before. At first the clear plastic design and form factor definitely gave us a case of deja-vu since it looks so similar to the prototype Gyre pumps (then Riptide) from MaxSpect, but upon closer inspection we realized that the only inspiration that AquaBee took from the Gyre is in looks alone. The WaveMaker pump from AquaBee has the same two-sided intake strainer design on opposite sides of a centrally mounted motor. However instead of turning vanes or turbines inside these exit strainers, the AquaBee Wavemaker has two propellers which push water away from the center of the pump. The water movement produced is like having two propeller pumps connected to one motor, but now the water flow comes out in a more laminar fashion kind of like the Gyre pump. 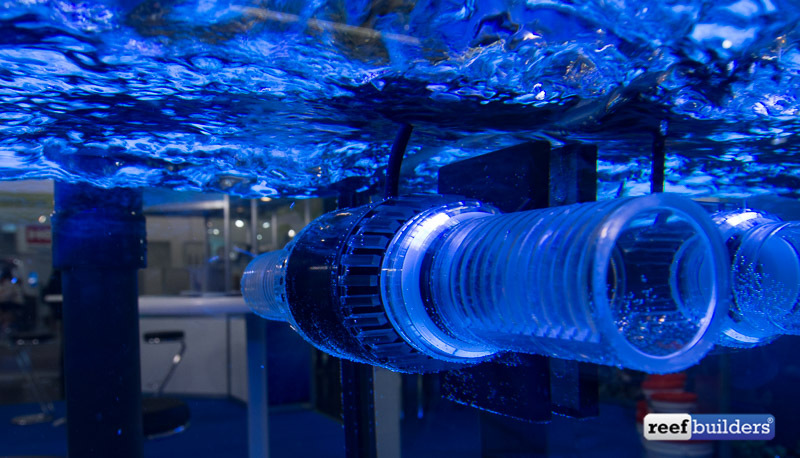 The interesting thing about the AquaBee WaveMaker is that they’ve taken the well established concept of using propellers to create water flow, and transformed its output to be more distributed, making it easier to create gyre-like momentum. Having two of these long outlets also allows reefers to direct water flow at different up and down angles, or depending on how it is mounted you could also direct the outflow of the AquaBee WaveMaker in opposite directions. Naturally the pump at the hear of AquaBee’s new pump design is of the controllable DC variety. Since the design is brand spanking new the measurements of its outflow is still to be determined. We don’t yet know how much water this pump moves at its maximum of 50 watts total pump power but at least with the dual propeller design we can expect a similar level of durability as we’ve already enjoyed with this form of water flow generation.